Whats Really Cookin’ in the Kitchen! Its really a lot of fun to design and decorate your new kitchen. Never have there been so many beautiful colors, great accessories and appointments, and appliance that truly offer advanced functionality combined with built-in good looks. So whats happening in todays well-dressed kitchen? 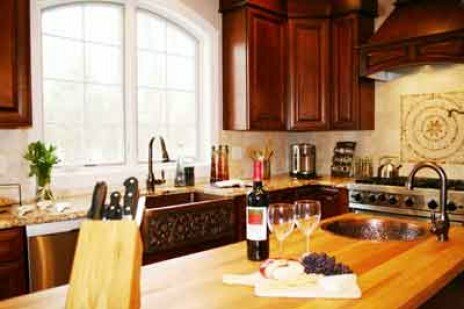 Natural Materials – Be it granite counter tops, ceramic floors and backsplashes designed to simulate stone, Stucco, and darker natural woods. The feeling is textures and colors found in nature. Stainless Steel – Following that rich natural feel, todays appliances will feel just as at- home in your kitchen as they do in a commercial restaurant. Commercial style ranges, ovens, refrigerators and dishwashers offer features once reserved only for professional chefs. Prices often reflect their awesome features. Cabinets that Simulate Fine Furniture – Beautiful door styles, flutes, cabinets on decorative legs, and moldings, moldings, moldings!!! You can share your kitchen with your living room furniture. Open Floor Plans – More and more homes are combining their living areas with their kitchens, providing the ultimate in entertaining and convenience. What a great way to achieve a feeling of spaciousness and togetherness. Emphasis on Design – There is a strong trend toward sensible and efficient design. People are spending more time planning their environment, incorporating non-traditional ideas, materials and methods to achieve a workspace that truly fits their unique lifestyle. They are also seeking the assistance of professional designers and decorators to insure compatibility. Stop into our beautiful new design center to see the latest in these and other kitchen and bath trends!